The property's 2018 Hurricane SunDeck 2200DC is included with your villa rental and is perfect for cruising the canals, spending a day on the river or visiting one of the many Gulf bariier island beaches nearby. With canal access from the home's private boat dock, you can reach the Caloosahatchee River at redfish cove in less than five minutes and the Gulf of Mexico in just 20 minutes. And there is nothing to compare with boating to one of our nearby waterfront restaurants or marinas for lunch or diner. Comfortable seating for eight, the new deeper V-Hull design of the 2018 Hurricane Sundeck 2200DC improves handling and overcomes large wakes easily and softly, while it also improving fuel economy. The Garmin 7" Color Combo ChartPlotter / Sonar / Fishfinder provides precision GPS navigation. Picture here at anchor just off the beach on North Captiva Island. Nothing beats a day at the beach — except perhaps a day at the beach when you arrive by boat. Never “beach” the boat if you plan to leave safe and sound. First, it's easy to get stuck. A falling tide, wind, or waves pushing onshore — or even a large wake from a passing boat — can easily leave you high and dry, and a quick survey of Internet boating forums shows that's a common occurrence. Second, even if that passing wake doesn't push the boat ashore, it can swamp the boat, riding up and over the transom, which — depending on how far up the beach you left your boat — may be lower in the water than usual. Its only safe to anchor on the gulf side of an island when winds are from the south and less than 12 knots. The new 2200DC Hurricane model allows the captain and first mate to seat facing forward in side-by-side fully adjustable matching captain’s & passenger helm chairs with flip-up bolsters. The biggest question when casting off in Bayside's Hurricane SunDeck 2200DC will be - which way to go? There is so much to see and do from Cape Coral's vast waterway system! Located on the Gulf of Mexico, this boating mecca virtually has it all. Whether you choose one of the popular area beaches, a boaters' only island destination or fishing from the deck, you and your family will love the ease and comfort of spending a day in this roomy, safe and stable boat. The boat is equipped with a livewell, fishing chair, fish finder and depth sounder, Sony AM/FM stereo amplifier with integrated IPOD Adapter with front and rear speaker pairs, below deck changing area, bimini top, cooler and much more. It's powered by Yamaha's new powerful fuel efficient F150XA four stroke engine, the most dependable outboard marine engine on the market today. It achieves 40% better fuel economy than the Villa's previous 2007 model, while providing all the performance you will ever need for your fun filled adventures out on the water. The Garmin echoMAP™ 74cv chartplotter/sonar pushbutton combo has a 7” screen and built-in Garmin HD-ID™ traditional sonar plus ClearVü sonar. The BlueChart® g2 Vision® HD coastal and offshore maps including everything available on NOAA charts in addition to the basic charts, tidal stations, currents, depth contours, IALA symbols and included fishing charts. You can connect your music device with a USB and a 3.5mm male-to-male stereo audio cable that transmits audio in stereo format and connects smartphones, MP3 players, or tablets to the boats MA300 Marine audio. It works with any device equipped with standard 3.5mm audio jack or AUX-in port. Bluetooth wireless technology is also supported so you charge your device with the USB and use BlueTooth to transmit your music with UHF radio waves to the MA300. In addition to physically connecting and charging music devices it also has Bluetooth® capabilities and app control, the 160 watt stereo comes with an AM/FM tuner. 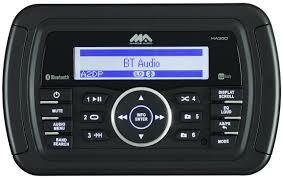 As an added safety feature, the MA300 has a seven-channel NOAA weatherband tuner that warns boaters of inclement weather. NOAA is a nationwide system that broadcasts local weather emergency information 24 hours a day. The network covers Florida and adjacent coastal waters. Remember that the USB and AUX 3.5mm audio-in ports are not located on the MA300 there to the right of the helm on the console away from the MA300 and it connects the audio-in port to 3.5mm audio socket and provides a USB A-type port for high speed data transfer and device charge power. Bayside maintains all coast guard required safety gear as well as area charts for you to use during your stay. In addition, we have a special local chart that shows the location and contact information for all the on-the-water dining destinations in the area.